We now offer the SmartSeat chairs in Black and White. Professionally Powder Coated here in the USA. Our Astronomy Observing chairs will last a life time and we guarantee this with our life time warranty. 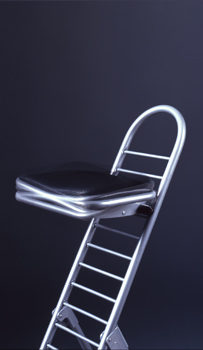 From a low crouch to a standing position, the seat height can be adjusted to 12 levels (12.5" to 33.5", 2" steps) by removing the seat and hooking it to the horizontal bars located on the chair frame. This means you can easily adjust your seat height according to your needs. A Smart-Seat observing Chair can guarantee the optimum posture anytime, anywhere. Other observing chairs tend to cause fatigue due to the uncomfortable posture they promote. SmartAstronomy's Smart-Seat Observing Chair solves this problem with four special rubber attachments under the seat base which allow the seat to tilt to the front and to the left and right so that it can adjust to your body movements and disperse the weight. The front tilted position of the seat is especially beneficial because it maintaining the natural state of the spine and hip which means less stress to the back and thigh, reducing back and neck fatigue.